So we have been in our new house for a couple of months now, but this is the first time I feel like I have actually had any length of time at home, as we had a holiday to South Africa, and then a lot of busy weekends. 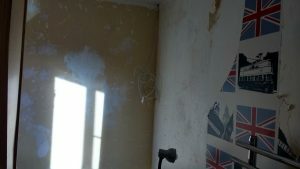 A few weeks ago we began the horrible job of wallpaper stripping. Originally we were going to do our bedroom and both offices, but after doing two rooms we decided that was quite enough. 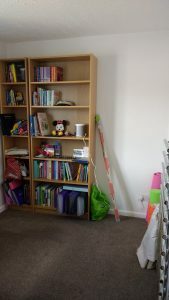 We had purposely left books packed in boxes, as we didn’t want to be moving full bookshelves while decorating, and after two rooms-worth of things were stored in Andy’s office, it made it clear to us that we needed to sort the first two rooms before we could realistically do anything with the third. 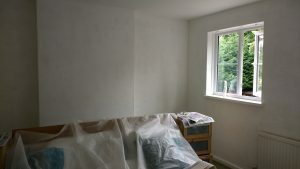 I had mentioned that I thought we would need to put up lining paper before painting, as the walls seemed quite bad, so once the ceilings were done, we used some left over paint to give my office a coat of white paint. We were pretty pleased with the results, and so decided to paint them straight away. 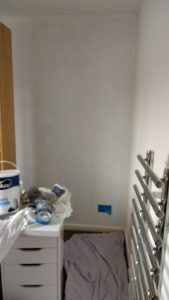 On Friday we spent the morning (and a lot of the afternoon) sanding down the walls, skirting boards, doors and radiators, and then cleaned the walls. The preparation took a while, but I am sure it will be worth it. 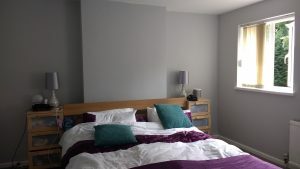 (We were lucky with our last house as it was a fairly new build, so the walls were smooth and the woodwork was pretty good, so we didn’t even clean the walls, we just painted them). On Monday morning Dad came over again, and we painted my office, painted the woodwork in there, and then painted white on the walls of our bedroom to give it a base coat. We thought we would need to give my office a second coat, so on Monday evening I bought more paint, but by the next morning it had dried properly and seemed fine. 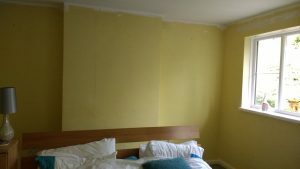 I had not bought the paint for our bedroom at this point as I thought it was all going to take longer, so on Monday evening I tried to buy it, but we went to two shops and it was not in stock. We checked online and a Homebase about half an hour away had 3 tins in stock, so at 7.55am on Tuesday I was sat in my car waiting for it to open! 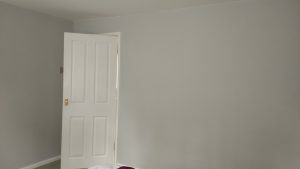 We spent Tuesday morning painting the bedroom with the first coat- we had chosen a darker colour so it was a bit more fiddly, and dried in a more patchy way- we knew we would need a second coat here. We had a bit of a time cut off as I had friends visiting after lunch, but I think we both appreciated have a shorter decorating slot as it is hard work! The bedroom after painting the ceiling and stripping the wallpaper. You can see how patchy the paint appeared at first. On Thursday we did the final coat to the bedroom, and all of the woodwork, doors, and radiator. As the colour was darker, I decided to do another coat on the skirting boards, so I did that on my own on Friday morning. We are going to have new flooring but that will wait until the autumn so all I need to do now is put the furniture back and unpack a few boxes of books. It feels great to have a couple of rooms looking a bit more how we would like them. I am so pleased with the final results, and we are so much further through than I thought we would be at this time. We are going to replace the carpet with some other flooring, and need to get some curtains as at the moment the windows have these weird office blinds, and at some point we will get some new furniture. We will also put up some pictures but at the moment we are enjoying how smooth and clean the walls appear! My office part way through- the wallpaper was rather interesting! 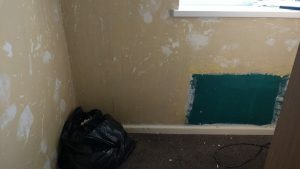 The walls were also terrible with all different colours all over them. Nice dark green paint where the radiator used to be. So this is my office now! The back wall has a large and small bookcase- lots of space for my cookery books, folders, work bits and speaker. I also found my foam roller, and my idea is to actually use it a bit more! Again, we are going to replace the carpet, probably with laminate or something similar as my chair wheels get very stuck on the carpet which is really annoying. 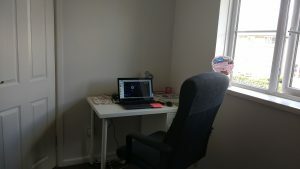 My desk is now behind the door, and my plan is to have a corner desk that goes around and under the window, so I can work at my laptop, but also have space for other things. As well as the flooring, we need to put up the blind (I bought a cool one with foxes all over it, but Andy needs to find his drill and that is probably buried deep in the shed), and then put up some pictures. For Christmas Andy gave me a world map that is magnetic, so you can use it as a notice board, but also has pins so you can put up where you have been or where you want to go. We have also made some progress in our garden. The previous owners had a dog, and next to the shed (the non-waterproof one…) was a dog cage and shed (kennel? It was the height of the shed, with a door). The cage was taller than the shed too. Anyway, we put it for sale on ebay (1p, buyer collects) and last week two people came along and took it carefully apart. 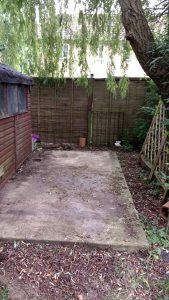 Annoyingly once it was gone we realised that the concrete base, which we thought went under the dog cage and the shed, only went under the cage. As we no longer have a garage, we wanted to get a big shed to store things like the lawnmower in. But the space is still fairly big, so last week we went to a shed showroom at a local garden centre, and have ordered one, to be delivered after our holiday. Although it has been really satisfying, as soon as we do one thing we find several other things to add to our list!